If Koreans are the kings (and queens) of Far-East Asian BBQ, then Texas reigns supreme as far as American BBQ is concerned. With heavy Spanish, Czech and German influences, Texas BBQ is bold and full of flavor. The Texan tradition of slow smoked BBQ is the opposite of the Korean quick grilling but the Texan method of BBQ forces the toughest cuts of beef to submit in tender submission. The traditional Korean way of making tteokbokki reminds many ex-pats of gnocchi’s chewey texture. 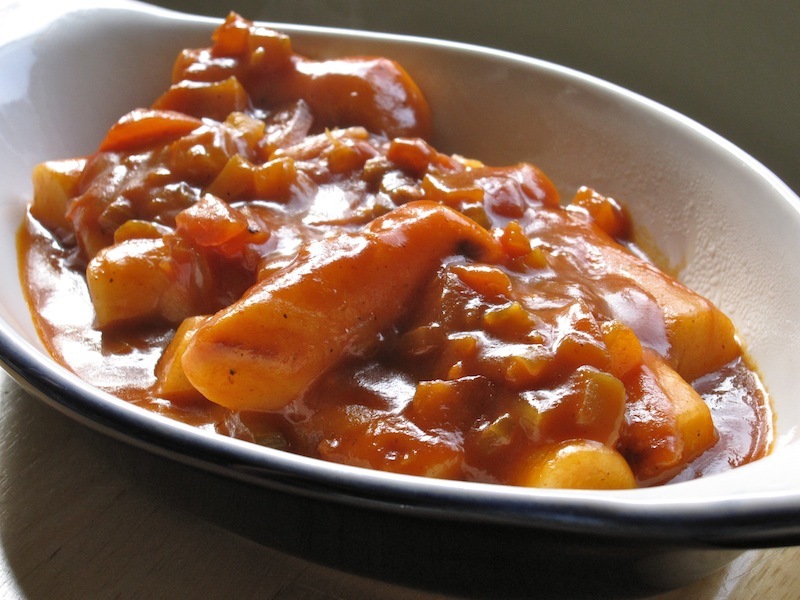 Some Americans have an aversion to tteokbokki because of the texture of the noodles. However, I like them either way. If you want to try something different frying the tteok noodles before making the sauce will give the tteok a crispy exterior. Most of the recipes I have shown so far cook the noodles to more of an “al dente” texture. If you like the Korean tteokbokki texture, you need to cook the noodles a bit longer, 10-15 minutes. I found this Texan BBQ sauce recipe at PepperFool.com. In a large, preheated skillet, add the grapeseed oil. Next you add the soaked and dried tteok and fry for about 5 minutes. Flip over and fry on the other side, until golden-brown. Remove from the skillet and set aside. Add onion, garlic and celery. Cook and stir until onion is tender. Stir in ketchup, vinegar, 1 1/2 cups water and Worcestershire sauce. Add bay leaves and black pepper. Stir a small amount of sauce into chili powder and blend well. Stir chili mixture into sauce. Allow the sauce to simmer for about 5 minutes. You will have leftover sauce after the noodles are gone. If you want to use up the rest of the sauce, you can saute 1 lb of lean ground beef, combine with the remaining sauce and make yourself some Texan-style Sloppy Joes. I’ve had a gorgeous seafood (clams), egg and silken tofu stew at a Koren restaurant in Edinburgh, and absolutely loved it. It made me completely addicted to Korean food. I’m not sure what else was in it.. But I was wondering whether this rings a bell, and whether you had a recipe for it at all? Thanks a million!